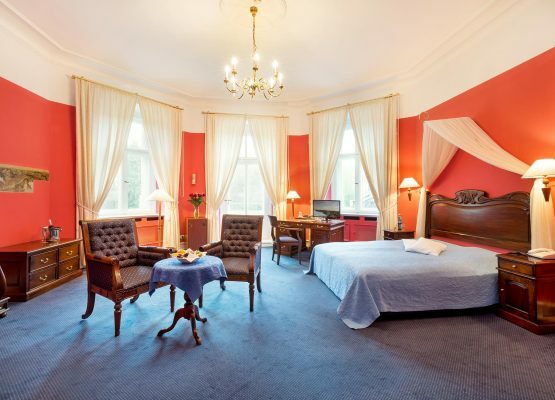 Our single rooms are located in the side wing with a view of the castle courtyard or park. 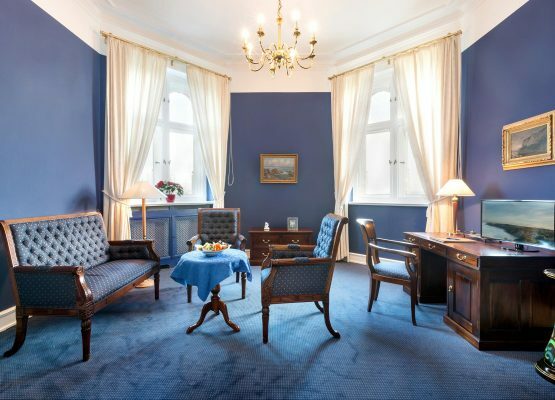 You will find the stately charm of the Schlosshotel here on 18 sqm. Our single rooms are equipped with TV, free internet access via WLAN, desk, seating, telephone, minibar, safe and fully equipped bathroom. The mahogany furniture was made especially for our house and is partly decorated with art nouveau elements. Our double rooms "Standard" can be found primarily on the ground or upper floor of the side wing and occasionally in the main building. Enjoy the unique castle arms on approx. 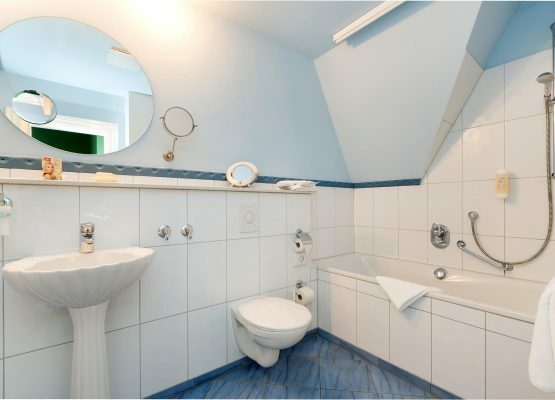 25 sqm with a view of the castle courtyard or park. 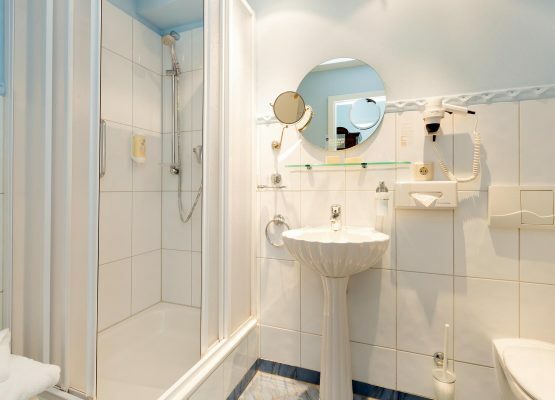 Our "Standard" double rooms are equipped with TV, free Internet access via WLAN, desk, seating, telephone, minibar, safe and fully equipped bathroom. The mahogany furniture was made especially for our house and is partly decorated with art nouveau elements. Our double rooms "Economy" are located on the ground floor of the side wing. 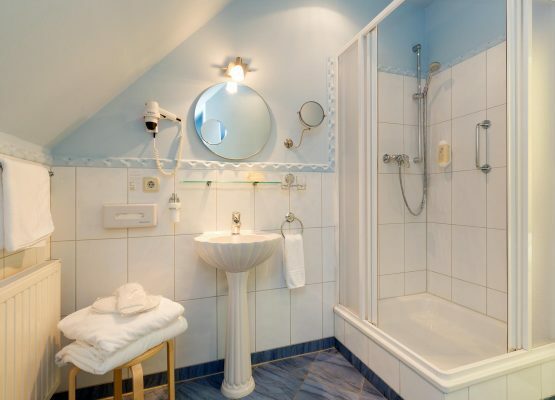 are made especially for our house and are partly decorated with art nouveau elements. 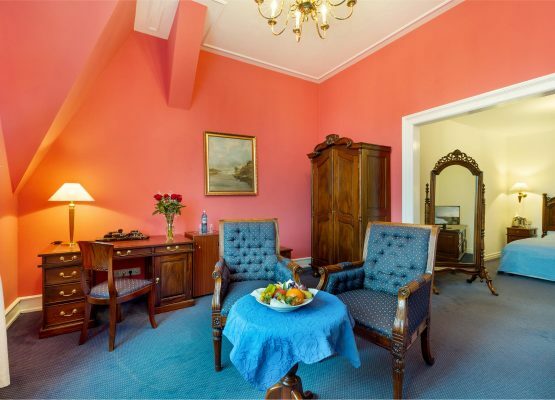 Our spacious maisonettes are located in the attic of the side wing and offer a view of the inner courtyard and the castle park. A staircase separates the living and sleeping areas and provides 35 square metres of space for a harmonious stay in the castle hotel. 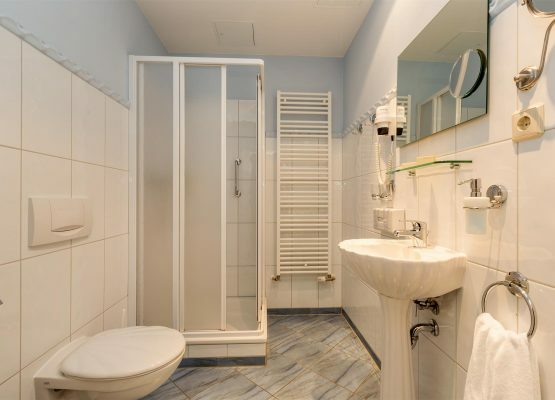 Our maisonettes are equipped with TV, free Internet access via WLAN, desk, seating, telephone, minibar, safe and fully equipped bathroom. The mahogany furniture was made especially for our house and is partly decorated with art nouveau elements. 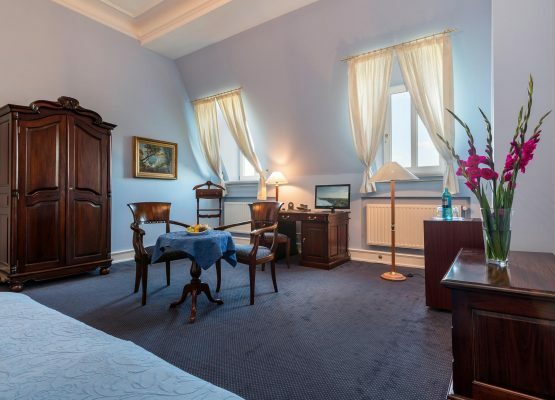 Our spacious triple rooms can be found in the historic main house. 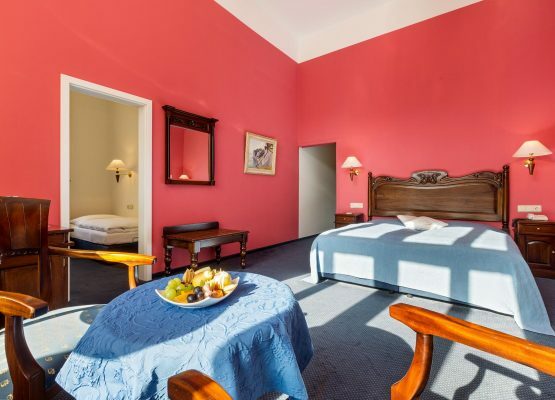 The tastefully furnished rooms are 32 square metres and offer you an unforgettable stay with a view of the castle courtyard. Our three-bed rooms are equipped with TV, free Internet access via WLAN, desk, seating, telephone, minibar, safe and fully equipped bathroom. 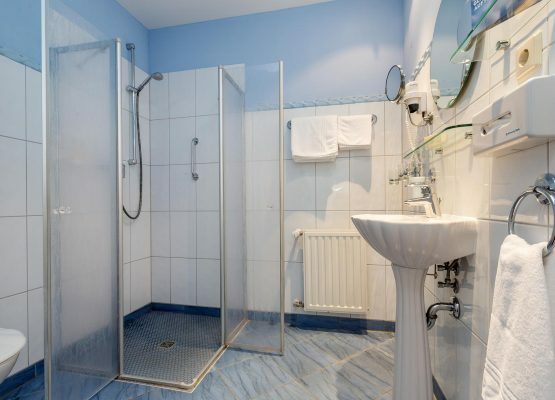 A separate bedroom is available for the third person. The mahogany furniture was made especially for our house and is partly decorated with art nouveau elements. 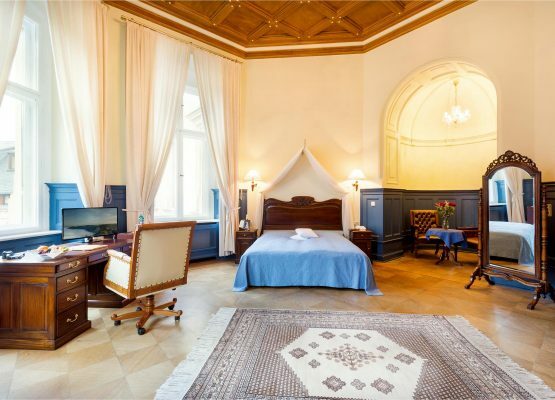 In our castle room "Komfort" you can particularly enjoy the flair of the castle. 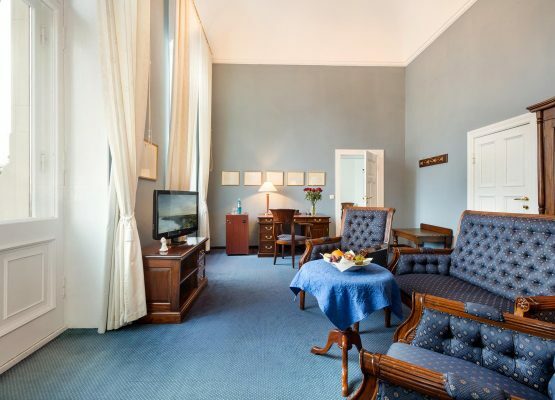 All rooms are individually cut (from 27qm) and are located in the main building. The stylish furnishings create an elegant and cosy atmosphere, to which the magnificent view contributes. 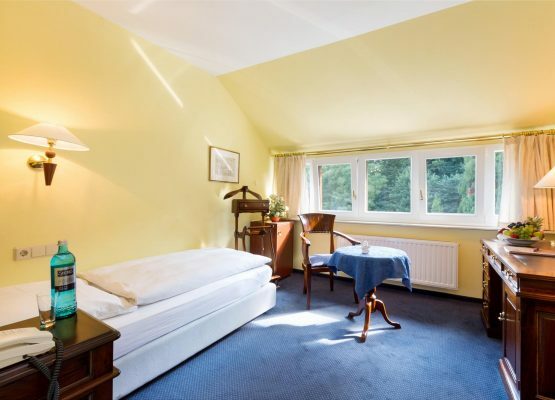 The rooms offer a unique view of the castle courtyard and park or the Great Jasmund Bodden as well as the natural stage Ralswiek (windows higher up here). 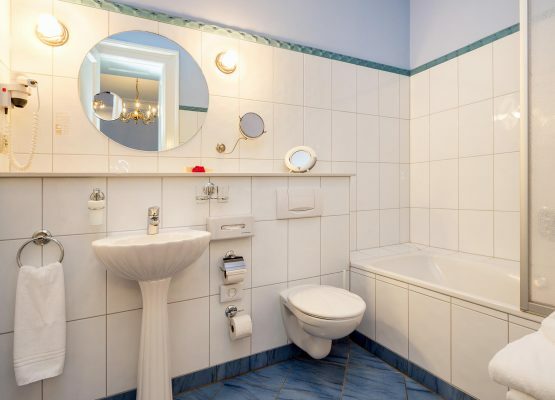 Our "Komfort" rooms are equipped with TV, free Internet access via WLAN, desk, seating, telephone, minibar, safe and a fully equipped bathroom. The mahogany furniture was made especially for our house and is partly decorated with art nouveau elements. 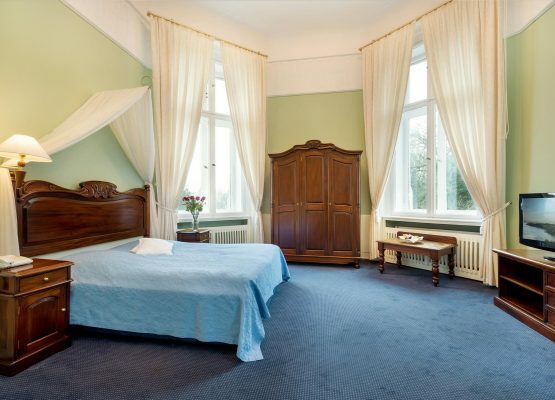 Our castle rooms "Superior Parkblick" in the main house are available from a size of 41 sqm. The historical living rooms of the count bring the history of the house to life and offer you a magnificent view of the castle courtyard and park. 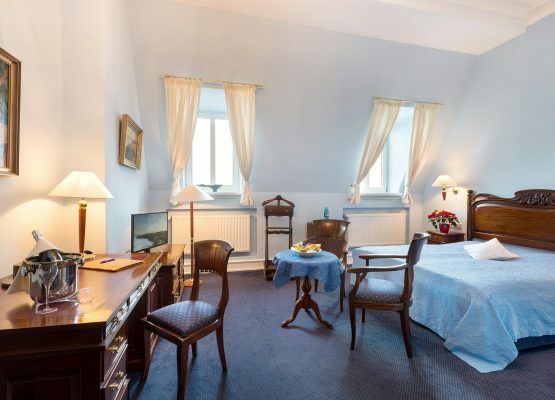 Our "Superior" castle rooms are equipped with TV, free Internet access via WLAN, desk, seating, telephone, minibar, safe and fully equipped bathroom. The mahogany furniture was made especially for our house and is partly decorated with art nouveau elements. 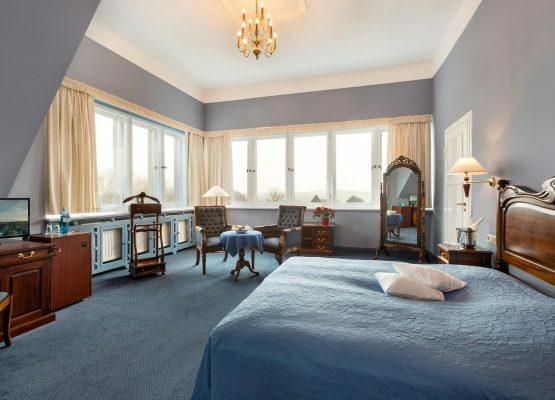 Castle Room "Deluxe Bodden view"
Our spacious castle rooms "Deluxe Boddenblick" in the main building invite you to dream from 40 sqm with an excellent view of the Great Jasmund Bodden. 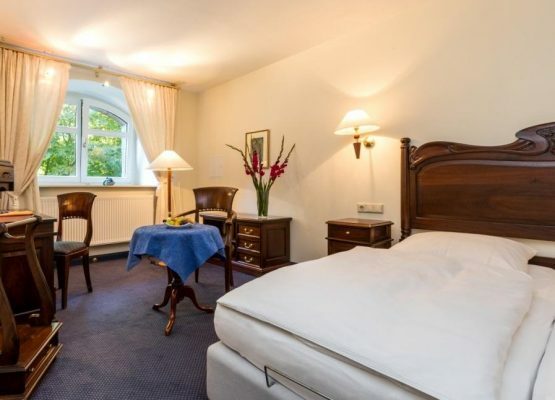 Our castle rooms "Deluxe Boddenblick" are equipped with TV, free internet access via WLAN, desk, seating, telephone, minibar, safe and fully equipped bathroom. The mahogany furniture was made especially for our house and is partly decorated with art nouveau elements. 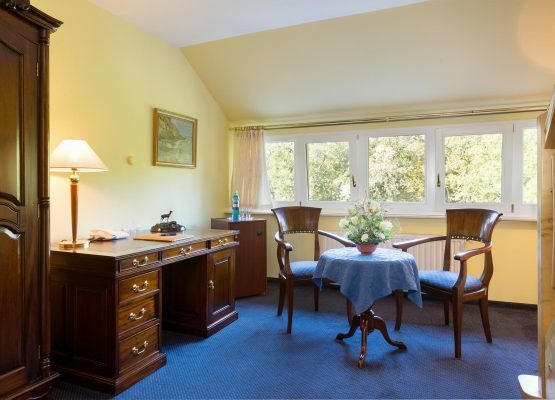 Our exquisite suites in the main building of the castle offer you a fascinating panoramic view of the Großer Jasmunder Bodden, the natural stage Ralswiek and the castle park on 45 - 53 sqm. Our suites are equipped with TV, free internet access via WLAN, desk, seating, telephone, minibar, safe and fully equipped bathroom. The suites also have a separate living and sleeping area. The mahogany furniture was made especially for our house and is partly decorated with art nouveau elements.